The Mongolian grasslands were the home of Kublai Khan’s famous city of Xanadu and the domain of Genghis Khan, who at the time of his death 800 years ago had the largest contiguous empire, stretching from the Caspian Sea to the Pacific. The location of Khan’s burial site is believed to be in Khentii province, in the western mountains. The Kherlen river valley, shown in the northern part of the map, is considered the homeland of the Mongol people (Steeds 2012). 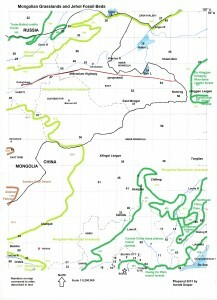 Most of this map area is grassland and associated with the lifestyle of pastoralists. However, the southeastern portion to the north and east of Beijing was formerly forested and reflects a heavily farmed landscape. This northern edge of the forests was the site of imperial tombs just to the north of Beijing and the Mountain Resort of emperors. The Great Wall was built along this northern forest edge as a protective barrier from the tribes to the north. The Jehol fossil beds of western Liaoning Province and adjoining Hebei and Inner Mongolia have provided an extraordinary series of discoveries in the last 20 years. During the early Cretaceous (about 125 million years ago), millions of dinosaurs, mammals, fish, insects, and plants died suddenly and left high-resolution remains showing details such as feathers and minute insect mouthparts. The sudden episodes were apparently related to volcanic eruptions, which buried the animals and plants quickly before they could deteriorate (Wang 1998). The time period of the preservation, at the time when mammals, birds, and flowering plants were evolving, is of great scientific interest. So far the fossil beds have yielded 60 species of plants, 1,000 species of invertebrates, and 140 species of vertebrates. The most important discoveries are of feathered dinosaurs, birds, and pterosaurs (Benton et al. 2008). The preserved organisms were both freshwater and terrestrial. Some of the discoveries are described below. The dinosaur origin of feathers, in dispute until the 1990s, was confirmed by finds in Liaoning. The earliest feather-bearing dinosaurs found were turkey-sized and predatory (Gibbons 1998, Gibbons 1996). The dinosaur Microraptor was found with four feathered ‘wings,’ and provided important confirmation that birds originated from a dromaeosaurid branch of dinosaurs (Benton et al. 2008). A dinosaur, Anchiornis, was found with fossil feathers in Jianchang County, Liaoning. Researchers were able to find evidence of color-imparting melanosomes from the feathers, which in turn allowed the reconstruction of feather colors. Quanguo Li et al. (2010) report that they were able to map color patterns in Anchiornis, which could not fly. The dinosaur had a red crown and black and white limb feathers, giving it an appearance much like a modern bird. The fact that the dinosaur could not fly indicates that feathers evolved for a different purpose, such as display or sexual selection. As a result of discoveries in northeast China, we know that the majority of theropod dinosaurs had feathers, and that some could fly or were gliders. A large number of fossil birds are known from the fossil beds. One discovery was of a bird with seeds in its stomach (Benton et al. 2008). There is also evidence of the evolution of feathers from early Creteceous fossil beds in Fengning Autonomous County in Hebei. A fossil bird, Protopteryx, had feathers with characteristics in between scales and feathers, providing fossil evidence for the origin of feathers from elongated scales (Fucheng Zhang and Zhonghe Zhou 2000). Pterosaurs, a group of flying reptiles that lived during the Jurassic and Cretaceous, are also represented in fossil discoveries from Liaoning. A female Darwinopterus was found in Linglongta, Jianchang County, western Liaoning. The female had an egg, and further examination confirmed that pterosaurs were different than birds. The egg had a soft, parchment-like shell, unlike bird eggs, and would probably have been buried in a nest. Their young were highly precocious and required little parental care, more like reptiles (Junchang Lu et al. 2011). This was the first pterosaur egg found. Ge Sun et al. (2002 and 1998) described a plant found in the fossil beds of Lingyuan, Liaoning. Archaefructus is believed to be an aquatic plant because of its thin stems and preservation in association with fish. Complete plants from roots to shoots exist. The plant superficially resembles seed ferns but it has female structures that are carpels, and stamens have bilateral symmetry. The plant lacked sepals and petals, suggesting that these structures had not yet evolved. Because it is the earliest fossil plant known with the beginnings of angiosperm flower structure, it is believed to be related to all known flowering plants. Also found in western Liaoning are fossil Brachycera flies, which are known to be important flower visitors. During the late Jurassic, they underwent a diversification to 46 genera, perhaps reflecting a simultaneous evolution of early flowers (Dong Ren 1998). The lakes where so many species were preserved were surrounded by conifers, ginkgos, and seed ferns, with few flowering plants. Prior to the flowering plants, there is evidence of insect pollination of gymnosperms and seed ferns, which does not occur today. This evidence is the presence of extinct genera of scorpionflies which are found throughout the northeast China fossil beds, including in Hebei (Pingquan Co.), Inner Mongolia (Ningcheng Co.) and Liaoning (Beipaio City). Modern scorpionflies are minor predators or feed on carrion and are not known as floral visitors. However, these gymnosperm-visiting species had elongate tubular tongues and likely fed on pollination drop secretions. They were present for 62 million years during the Jurassic and Cretaceous, becoming extinct when flowering plants became more dominant in terrestrial ecosystems (Dong Ren et al. 2009). One group of scorpionflies evolved to mimic ginkgo leaves (Wang et al. 2012); they became extinct before the widespread appearance of flowering plants. Mammals of the age of dinosaurs were thought to be small primitive creatures. However, discoveries in northeast China paint a different picture. One 164-million-year-old skeleton, found in Nincheng County, Chifeng Prefecture, Inner Mongolia, is from an animal with a beaver-like tail and seal-like teeth, suggesting an aquatic lifestyle. Hair and webbed feet were also preserved. The morphologically advanced mammal was contemporaneous with pterosaurs. (Martin 2006; Qiang Ji et al 2006). Another mammal fossil, Sinodelphys, from Lingyuan, Liaoning, has characteristics that define it as closely related to marsupials. However, these skeletal remains are 50 million years older than all other known marsupials. Grasping feet suggest that the animal was a tree climber (Zhe-Xi Lou et al. 2003). Living marsupials are restricted to Australia and South America, with the exception of the opossum, which recently immigrated to North America. Two early mammals, Sinodelphys and Eomaia, one a possible ancestor of marsupials and the other a possible ancestor of placentals, are found in the same geological layer in China. These are the oldest of their type of mammal known. This dates the split between the two types of mammals to 125 million years ago. The habitat preference for trees may also be related to the divergence between the two types of mammals, but further evidence is needed to confirm this (Cifelli and Davis 2003). Placental mammals later diversified mostly in North America during the Cretaceous, while marsupials diversified in Asia during the same time period. More ancient rocks to the west of Liaoning in Hebei have also been the site of important discoveries. Zhu Shixing and Chen Huneng (1995) reported that hundreds of fossils shaped like leaves were found in rocks more than 1.7 billion years old. These were interpreted as algal in origin, perhaps similar to today’s brown algae. Finally, a 2.5-billion-year-old rock formation of pillow lavas near Dongwanzi in Hebei appears to be an ancient ocean spreading center, suggesting that continental drift processes were in operation earlier than had been thought (McKusky et al. 2001; Reed 2001). Abell, Robin and 27 others. 2008. Freshwater Ecoregions of the World: A New Map of Biogeographic Units for Freshwater Biodiversity Conservation. Bioscience 58:403-414. Cifelli, Richard L. and Brian M. Davis. 2003. Marsupial Origins. Science 302:1899-1900. Ge Sun, Qiang Ji, David L. Dilcher, Shaolin Zheng, Kevin C. Nixon, and Xinfu Wang. 2002. Archaefructaceae, a New Basal Angiosperm Family. Science 296:899-904. Ge Sun, David L. Dilcher, Shaoling Zheng, and Zhekun Zhou. 1998. In Search of the First Flower: A Jurassic Angiosperm, Archaefructus, from Northeast China. Science 282:1692-1695. Gibbons, Ann. 1998. Dinosaur Fossils, in Fine Feather, Show Link to Birds. Science 280:2051. Gibbons, Ann. 1996. Early Birds Rise from China Fossil Beds. Science 274:1083. Gibbons, Ann. 1996. New Feathered Fossil Brings Dinosaurs and Birds Closer. Science 274:720-721. Global Network of National Geoparks. www.globalgeopark.org (accessed 12/20/12). Harper, Damian et al. 2011. China. Lonely Planet. Junchang Lu, David M. Unwin, D. Charles Deeming, Xingsheng Jin, Yongqing Liu, and Qiang Ji. 2011. An Egg-Adult Association, Gender, and Reproduction in Pterosaurs. Science 331:321-324. Kohn, Michael. 2008. Mongolia. Lonely Planet. Martin, Thomas. 2006. Early Mammalian Evolutionary Experiments. Science 311:1109-1110. McKusky, Timothy M., Jiang-Hai Li, and Robert D. Tucker. 2001. The Archean Dongwanzi Ophiolite Complex, North China Craton: 2.505-Billion-Year-Old Oceanic Crust and Mantle. Science 292:1142-1145. Normile, Dennis. 2000. New Feathered Dino Firms Up Bird Links. Science 288:1721. Olson, David M., et al., 2001. Terrestrial Ecoregions of the World: A New Map of Life on Earth. BioScience 51:933-938. Qiang Ji, Zhe-Xi Luo, Chong-Xi Yuan, and Alan R. Tabrum. 2006. A Swimming Mammaliaform from the Middle Jurassic and Ecomorphological Diversification of Early Mammals. Science 311:1123-1126. Quanguo Li, Ke-Qin Gao, Jakob Vinther, Matthew D. Shawkey, Julia A. Clarke, Liliana D’Alba, Qingjin Meng, Derek E.G. Briggs, and Richard O. Prum. 2010. Plumage Color Patterns of an Extinct Dinosaur. Science 327:1369-1372. Dong Ren, Conrad C. Labandeira, Jorge A. Santiago-Blay, Alexandr Rasnitsyn, ChungKun Shih, Alexei Bashkuev, M. Amelia V. Logan, Carol L. Hotton, and David Dilcher. 2009. A Probable Pollination Mode Before Angiosperms: Eurasian Long-Proboscid Scorpionflies. Science 320:840-847. Dong Ren. 1998. Flower-Associated Brachycera Flies as Fossil Evidence for Jurassic Angiosperm Origins. Science 280:85-88. Zhu Shixing and Chen Huineng. 1995. Megascopic Multicellular Organisms from the 1700-Million-Year-Old Tuanshanzi Formation in the Jixian Area, North China. Science 270:620-622. Sneath, David. 1998. State Policy and Pasture Degradation in Inner Asia. Science 281:1147-1148. Spalding, Mark D. and 14 others. 2007. Marine Ecoregions of the World: A Bioregionalization of Coastal and Shelf Areas. Bioscience 57:573-583. Steeds, Oliver. 2012. The Hidden Grave of History’s Greatest Warrior. Newsweek, December 10, 2012, pp. 24-28. World Heritage List. http://whc.unesco.org/en/list (accessed11/6/10) and World Heritage Tentative Lists (http://whc.unesco.org/en/tentativelists/5318/). UNESCO-MAB Biosphere Reserve Directory. http://www.unesco.org/mabdb/br/brdir/directory/database.asp (accessed11/6/10). Wang, Justin. 1998. Scientists Flock to Explore China’s ‘Site of the Century.’ Science 279:1626-1627. Yongjie Wang, Conrad C. Labandeira, Chungkun Shih, Chen Wang, Yunyun Zhao, and Dong Ren. 2012. Jurassic Mimicry Between a Hangingfly and a Ginkgo from China. Proceedings of the National Academy of Sciences Early Edition, November 26, 2012 (www.pnas.org/cgi/doi/10.1073/pnas.1205517109). Fucheng Zhang and Zhonghe Zhou. 2000. A Primitive Enantiornithine Bird and the Origin of Feathers. Science 290:1955-1959. Zhe-Xi Luo, Qiang Ji, John R. Wible, and Chong-Xi Yuan. 2003. An Early Cretaceous Tribosphenic Mammal and Metatherian Evolution. Science 302:1934-1940. Zhu Shixing and Chen Huineng. 1995. Microscopic Multicellular Organisms from the 1700-Million-Year-Old Tuanshanzi Formation in the Jixian Area, North China. Science 270:620-622.